Balinese style 4 bedroom villa with private pool within a walled garden, with 4 double bedrooms and en suite bathrooms, sleeps 8. 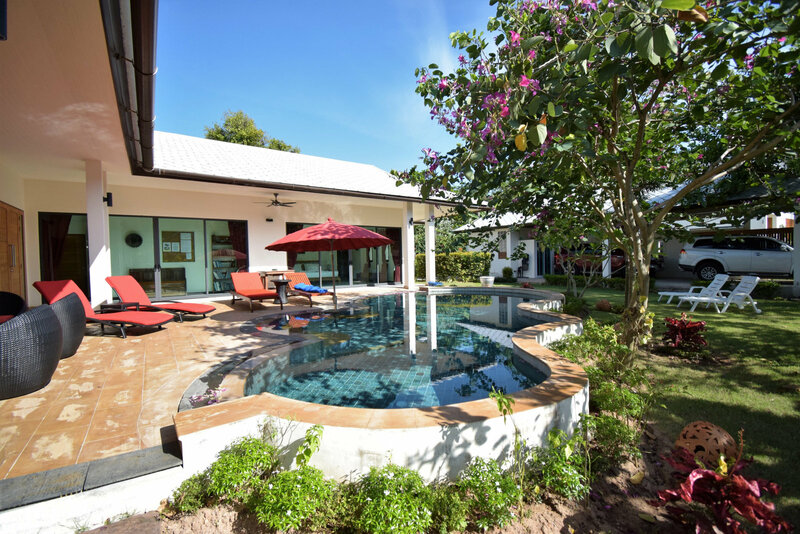 Coconut Paradise Villa P10 is a 4 bedroom single floor villa with a ramp access. It is equipped to European standards, with private pool and jacuzzi. Located within a secluded walled tropical garden, only 30 seconds walk down the garden path to the soft sands of Bang Po Beach. P10 is situated on an 800 sqm plot and provides spacious accommodation. The villa opens out onto a pool deck with a private pool and jacuzzi set in a secluded garden which allows guests to relax in quiet privacy. Alternatively, by the beach and located just half a minute away is a larger shared pool also available to Coconut Paradise guests. P10 was built in modern Balinese style and completed in 2016. 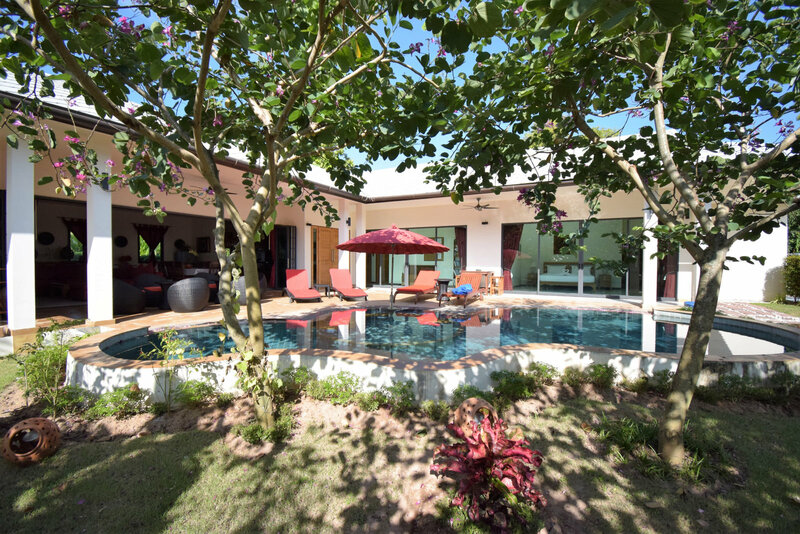 Villa P10 sits opposite villas P9 and P11 which makes for easy access between the villas for larger parties. The villa will comfortably accommodate 8 guests. Villa P10 is accessed from the drive via a ramp providing easy access for push chairs or wheel chairs. 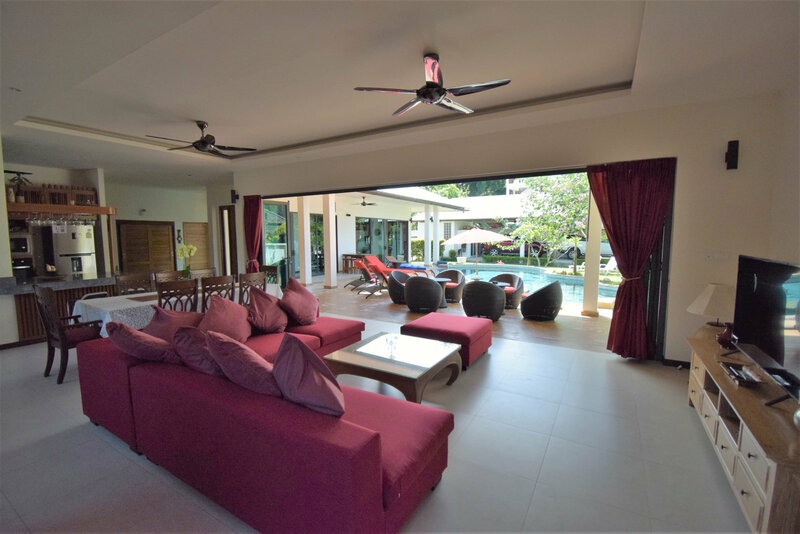 The villa is tastefully furnished throughout in Thai teak wood and English oak with ceiling fans to all rooms. All bedrooms are air-conditioned and have en suite bathrooms. The extensive living area opens onto the pool deck through 7 meter folding doors, bringing the pool deck “into the villa”. Entry to the villa is through the front porch that then leads into the inner hallway. The layout is open plan. The fully equipped European style kitchen is ahead of you as you walk in. The kitchen is fitted out with modern cooking appliances including oven and separate hot plates, microwave, 2 fridge-freezers, coffee maker, rice cooker, toaster and cooking utensils. A full complement of crockery, glassware and cutlery are also provided. Adjacent to the kitchen is the dining room, the large oak refectory dining table will accommodate 8 in comfort and has views over the pool and garden. Further along there is lounge seating, this area being equipped with smart TV and DVD player. TV programming is through the internet which provides over 300 channels in several European languages and stock of over 1,000 movies. Along the hallway there are 2 double and 2 twin bedded rooms. The master bedroom has a king sized bed and adjoining large en suite and dressing area. The master bedroom has sliding doors onto the pool deck. Bedroom 2 is also equipped with a King sized bed, whilst bedrooms 3 and 4 have twin beds. 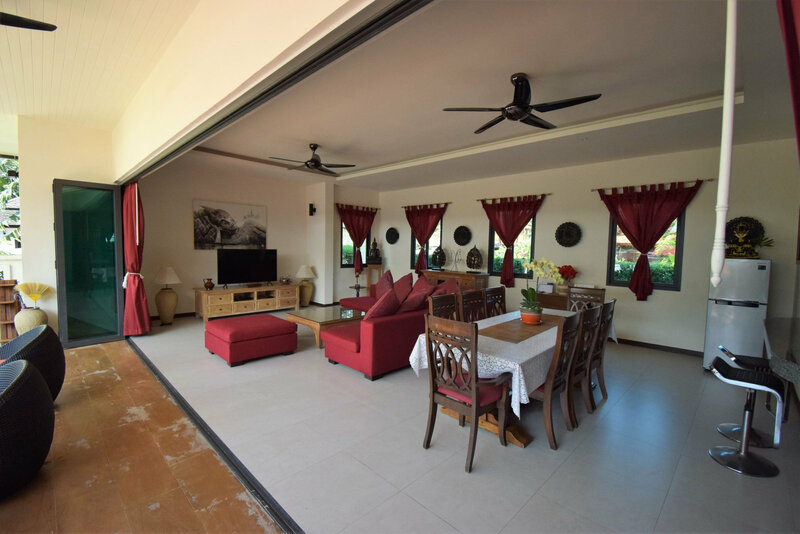 All 4 bedrooms have en suite bathrooms and are equipped with ceiling fans and air-conditioning. A further guest “powder room” is found off the hallway. Complimentary WiFi internet access is available throughout the villa. The villa is safe for children to play within the walled garden or indeed outside the garden. The beach is sandy and quiet (no mass tourism). There are 5 restaurants within easy reach, 3 are a short walk down the beach (Jun Hom, The Sea and By The Beach). A further restaurant is located near the villa entrance (The Terrace). There are numerous other restaurants and bars within walking distance, both along the beach or the road. Family Mart and 7/11 convenience stores are located in either direction down the road and there are several local Thai shops, a chemist and money exchange all nearby. The nearest centres for shopping and restaurants are about 10/15 minutes drive (Maenam or Nathon). Nowhere on Samui is that far away as the island is only 20 km by 25 km, however we would recommend you hire a car during your stay. Driving on Samui is quite straight forward, with one major road around the island, cars are RHD and drive on the left as in UK/Australia. As previously mentioned, we would recommend car hire during your stay, although it is possible to flag down the local buses or pick-up taxis that frequently pass the entrance. International car hire companies such as Hertz and Avis are present at the airport. We have few house rules other than to ask you to treat our villa as you would treat your own house and leave it in the same condition you found it. Smoking is permitted, although we ask you not to smoke in air-conditioned rooms. Pets are allowed by arrangement. Plastic glassware is provided for use in and around the swimming pool.